You can learn how to install carpet in an hour or so, but the actual process is often a challenge. It'll require renting equipment and means a physical workout. If you have back, knee or leg problems, don't try to install carpet yourself. Laying carpet involves putting down sharp tackless strips, using sharp cutting tools, and possibly using an iron and glue adhesive-tape to create seams. These can all cause injury if you aren't careful. You'll also need to get rid of the old carpet (which can be heavy, dusty and unwieldy) and muscle the new carpet into place. Can You Use Carpet Tiles to Carpet Stairs? Before you can put new carpet down, you'll probably have to remove the old carpet. Loosen or remove the molding or trim around the walls and thresholds so you can access the edges of the old carpet. This should allow you to pull it off the existing tackless strips. Once the carpet is free of the strips, roll it or cut it into sections for easy disposal. Some people like to reuse their carpet pads, but this is usually a bad idea. Most new carpeting is sold with an extended warranty if you buy a new pad, which is usually a smart choice. A good carpet pad will extend the life of your carpet and make it feel much nicer underfoot. If you're pulling up the pad, watch out for deteriorated padding material and wear a respirator if you have to. Once the carpet is up and out of the way, give the room a once over with your vacuum cleaner. The term "tackless" here is really a misnomer from a use perspective. These small strips of wood contain tiny metal teeth that hold carpet the way sharks' teeth hold prey. They're slanted and designed to angle toward the wall. Once the carpet edge is stretched and impaled on them, it won't come loose. The goal here is to put down tackless strips about a half inch from the walls. You can use the old strips as a guide for placing the new ones. You won't have to stretch the pad, but it will have to be pieced and stapled in place. Make sure sections of pad aren't overlapping but do touch. To keep them from shifting, tape them to one another. 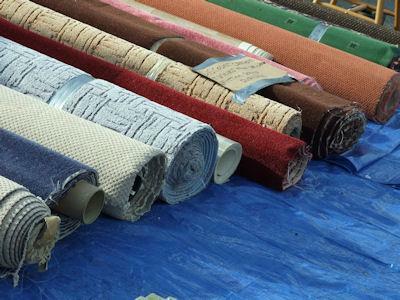 Before you buy, cut or start installing carpet, determine if and how you plan on seaming it. If you're lucky, your install won't require a seam. If it does, try to place the seam in the least visible and trafficked area possible. Although the seam won't be visible on most new carpet, the line will become more prominent as the carpet ages. When you determine the length of carpet you need, plan on an extra four to six inches around the perimeter of the room and at each seam. Creating seams will be much easier if you overlap both pieces and make a single cut through both. This will insure that both sides match exactly. Before you do this, protect whatever is underneath with a piece of plywood. Keeping seams in place requires a special tape that uses heated glue. To use it you'll need to rent a special seaming iron. They get hot, smell and can be a bit scary, but you won't have a good, professional seam without using tape. It creates a very minimal bump (unlike the tackless strips) and really holds the carpet in place. When you're ready to put the carpet down, you'll need three more tools, a power stretcher, seam roller and a knee kicker. All are used to flatten, stretch and secure the carpet. To keep carpet from rippling or migrating, stretching it is an absolute requirement. Carpets stretch and contract in response to the ambient temperature and humidity in the room. If carpet isn't securely affixed to the floor, it will be a continuing nightmare to control. The knee kicker requires some explanation; kick it to force the carpet edge in place over the tackless strip. If you're working on a large carpet, using a knee kicker can be taxing, so be forewarned. Reading the instruction and safety information that comes with the rental of the seaming iron, knee kicker, carpet stretcher and carpet roller will help you understand how to install carpet better and avoid most of the obvious problems. Although installing carpet can be a one man project, this is one job where having a couple of extra hands -- and a strong back, can be a big help.